Swimming pools (and Spa’s) are in fact mild chemical baths, nice ones though. For concrete pools it’s important to keep the pool water from reaching and reacting with the reinforcing steel in the concrete shell. This is even more so with salt water pools, as such water penetration can result in corrosion of the steel work leading to “concrete cancer” and in some cases structural failure. Epotec being a thick coating offers to water proof the inner surfaces of the pool and will assist in keeping the pool water away from the steel, as it’s largely water and vapour proof. By the same token it will tend to try to stop any ground water that passes through porous concrete, entering the pool water too, for the same reasons. Though any such ground water may due to hydrostatic pressure, it can cause blisters to form in the Epotec coating, which can result in delamination, as will happen with any applied coating. With Fiberglass pools the Epotec, being a high build coating in general replaces the worn gel coat, offering to protect the underlying fibreglass shell from pool water ingress and saving the shell from being compromised due to water absorption. 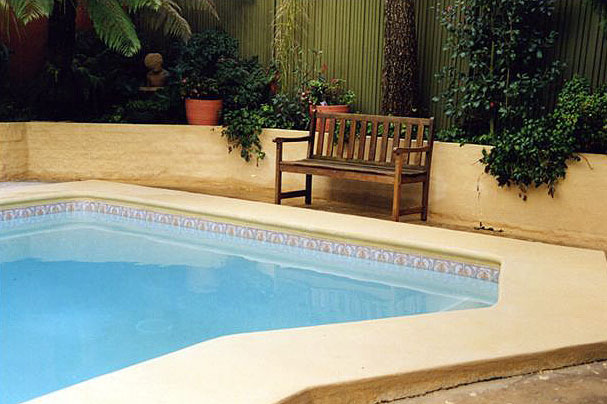 With a Marblesheen, Pebblecrete Fibreglass or a Concrete (Painted), pool/spa, generally after 15-20 years the original surface will be worn, tired and need to be resurfaced. It may even be less than10 years if the pool surface is poorly finished or has had a lot or wear and tear. Over time you will find the pool surface starts to break down and becomes porous, becomes difficult to keep clean, harbouring dirt and bacteria. It may even start to crack and blister. 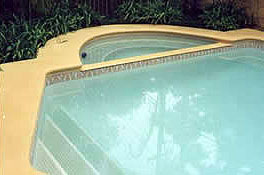 For your new pool Epotec offers a great long lasting and decorative finish with out costing a lot. Epotec is available in a range of attractive colours to suit any location and decor. You can even include murals for added style. 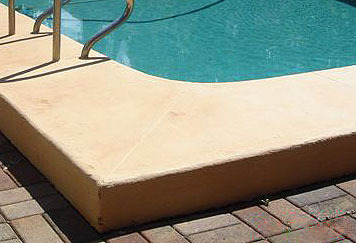 Epotec can be applied to a new rendered concrete surface by your self saving even more money or by contractor – painter. The choice is yours. Either way you will get a great long lasting easy to maintain finish. Compared to Tiles Epotec offers a seamless finish with no tile joints to get dirty, no tiles to fall off. Compared to Plaster Type finishes (which cannot be refurbished easily) Epotec has no rough surfaces to scratch the skin, and a smooth finish for easy cleaning. In addition is long lasting and easily up graded, to prolong its lifespan. When selecting your pool finish think carefully, it can cost you BIG money with the wrong choice. You can NOW see painting is the way to go, however there are two types of pool paint on the market. Our epoxy, called EPOTEC, out sells the chlorinated rubber paint by many times, due to its longer lasting, harder wearing features. EPOTEC Hi Build has proven to be the best, long term pool paint, with over 20 years usage in the demanding Australasian environment. From schools and commercial pools, to residential pools and spas. …Epotec Hi Build is the answer. When you chose Epotec Hi Build you choose the best.